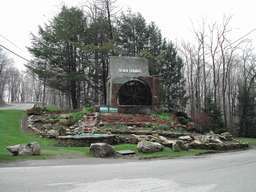 Seven Springs is famous for it's four seasons of amenities including skiing, snowboarding, horseback riding, fishing, and scenic history tours. Condos, chalets, and cabins are all available for rent, purchase, or longterm lease. A private community adjacent to Seven Springs Resort consisting of single family homes. Situated on approximately 10 acres, this serene location offers streams, trout ponds, trails, wooden bridges, woods and full-time groundskeeper. A well-kept mountain secret! This is the original single family community for Seven Springs. These homes range in size from 2,460 square feet and up! Two car garages are standard and most lots are half an acre. These properties are within a short driving distance to the main gate of Seven Springs. Best buys are usually found off of the mountain! Check them out! The SunRidge condos were so popular that the designs were modified and enlarged for this community. Still twelve to a building but NO one bedroom’s here, just two’s and three’s. Only the first building can truly be considered slope side. The remainder can be skied back to but you’ll need to shuttle to the slopes. The first condominiums ever built at Seven Springs. You can walk to the golf course from here! There are two types of condos in this community. The four story brick buildings have concrete in between the floors which makes for great sound proofing! Interior hallways shelter you from the outside elements. Three story side by side condos offer more space. Gated community with single family residences on three or more wooded acres. This newest slopeside communitiy began transferring properties in 2006. The average selling price then was $527,784. Southwind is the only community at Seven Springs that has a chair lift unloading inside its boundries. This is the smallest community in all of The Villages with only 40 condos in five buildings. These two, three, and four bedroom properties were spaciously designed. The two bedrooms are always on the end with their own private entries. The three and four bedrooms have an interior common hallway. Remember the higher up you go the more spectacular your views are of the surrounding mountains. If you can find one of these in the rental, book it!! This community consists of five buildings located at the top of Boomerang Ski Trail. Buildings A, B, C, and D were constructed to accommodate overflow house guests from the hotel with a floor plan design referred to as a “lock out.” Three and four bedroom condos were built with two private entry doors named “A” and “B”. The “A” side will have one or two bedrooms, kitchen, dining room, living room, and one or two baths. Inside there is a double door that locks out the “B” side which always has two bedrooms, and one bathroom. There is NO kitchen on the “B” side. Building E condos in StoneRidge were redesigned with gas fireplaces and NO lock outs. Most StoneRidge properties have great views and are slope side. Getting to and from these condos usually involve stairs. If they challenge you please make sure you ask the reservationist how you access the rental from the parking area. There are both condominiums and town homes here. You’ll find many differences between the two. If you want a view go for the one, two, or three bedroom condos. There’s a mixture of twelve in each building. The majority were built on Village Ski Trail (easy) with access from your back door or a walk around the building. If you prefer a little more privacy go for a “North Star” town home. These designs are always two floors where your only neighbors are beside and behind you. They all have a one car garage. There’s only four homes to each group and they all have first floor bedrooms! One of the best designs on the mountain for one level access. This community of 305 condominiums and town homes begun in 1980 and was completed in 1987. If you’re looking for a place with trees and green space choose Swiss Mountain. Entering from County Line road you’ll pass several town home designs with two or three levels. Many of these have spectacular views of the ski slopes especially for night skiing. Bath rooms are usually up or down stairs with few available on the main floor. Check with your reservationist for details. When you come to the summer amenity center you’ll find two different condominium building designs. A warm burnt orange exterior paint designates the first. A square building foot print allows for four floor plans in each building. Four condos on the ground floor and four on the second, all offer decks or patios. The grey buildings are referred to as the Chateau’s and line the ridge. There are eight condominiums in these properties too. This building foot print is a rectangle with four condos on the lower level and four on the upper level. Each building offers four end condominiums. Another mixed community with both condominiums and town homes. You CAN NOT ski out to the slopes from this community. If the weather is cooperating you may be able to ski back. The town homes are side by side with three or four to a group. If you’re looking for a view ask your reservationist as some sit on a ridge and others are built in the center. You’ll find two and three bedroom designs all using two floors. These properties also offer a one car garage. The condominiums line the ridge and many offer breathtaking views. Size wise there are two, three, and four bedrooms. This is the last community (which makes them the most modern) completing the Villages at Seven Springs in 2004.